As part of a large network of online dating sites, Boaters Dating gives members an opportunity to meet others who share their love of boating. Free members can set up profiles, recieve and reply to email, and upload up to 5 photos. Join for free and see if this is the site for you. 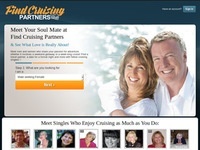 Boating Passions is a 100% free site for singles with a passion for boating. Whether you enjoy sailing, fishing, yachting, or cruising, Boating Passions is the site for you. Swimmers Passions is a free dating site for singles who love to swim. Join for free and take advantage of free email, chat, forums and more.